Desperation is a horror movie made for TV on the basis of the 600+ pages novel with the same name by the author Stephen King. 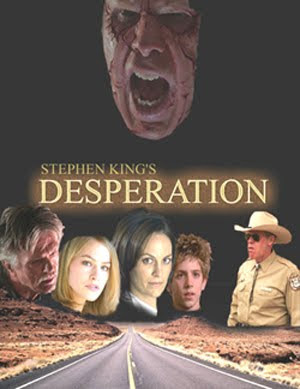 Stephen King's Desperation is Stephen King's television movie adaptation of his own novel of the same name, which was filmed in 2004 and broadcast in 2006. The film is directed by frequent King collaborator Mick Garris and stars Ron Perlman as Collie Entragian, Tom Skerritt, Steven Weber and Annabeth Gish. Filming primarily took place in Bisbee, Arizona, in the nearly deserted Lowell borough, with other sequences in Old Bisbee, the outskirts of Bisbee and Tucson, Arizona. During filming, a set in the Tucson Convention Center (TCC) caught fire. Five people were injured. The fire destroyed everything on the set, including all production gear and equipment, and the TCC was heavily damaged. Someone down there did not want this movie to be made. But God wanted otherwise and that is what is truly important. Even the most polite commentator would probably not call this a great movie. The beginning takes the viewer in with a powerful grip. The performance of Ron Perlman as the murderous sheriff Collie Entragan is excellent. Steven Weber is a natural and creates a believable pleasant character as Steve Ames. But when you get the feeling with the other actors that they are acting you know that the film is in deep trouble. Also, when an actor of such capacity as Tom Skerritt does not seem to be at all motivated with the movie he is acting in the stars are clearly in a wrong constellation. The film with its ups and downs in no way makes justice to the horrific atmosphere in the novel Desperation. Rather, it makes the viewer feel like a visitor to a rather predictable ghost train in a cheap amusement park with its hanged victims, pierced eyes, detached human hand, disfigured faces of human monsters and piles of rotten human bodies. But despite of this there are some quite remarkable things that make this a unique horror movie. Mary (Annabeth Gish) is imprisoned by the evil spirit Tak and wakes up in a shack near the entrance to the old mine. She finds herself locked in a little room filled with big hairy spiders and poisonous snakes. This is the fundamental fear of a person suffering from arachnophobia and just imagining such a situation may be overwhelming to that person. Seeing it on a film with Mary screaming at the spiders climbing her back and lurking at every corner is a horrible situation as there is no way to escape. I am not sure if Stephen King wanted this part of the movie Desperation to be therapeutic or if he just followed his imagination letting things flow as they come. However, it is genuinely therapeutic and excellent as such. As in a good psychological therapy session, Mary gets a grip of her fear, literally, by holding a big hairy spider in her hand and looking at it. She realizes that this creature cannot in reality bite her - in this case also the poisonous snakes are miraculously unable to harm her like in a good psychiatric session where the therapist directs the phobic person to such a situation... and out from there. Mary crushes the spider in her hand - a major step forward for a person suffering from the fear of spiders - and throws the disgusting remains of the animal away. Like in good therapy session she discovers a way out from the shack hidden behind the fridge. For a claustrophobic person such imagining of a way out even in a miraculous way can be highly therapeutic. Desperatation film is real mental medicine for people suffering from the very real problem of arachnophobia and for this reason I recommend it - but only in good company and with a planned escape route from viewing the movie also (stopping the DVD if it is too hard). The psychological wisdom of Mary in the spider and snake shack was quite a surprise in the midst of a rather mediocre horror movie. But I was even more taken aback by the powerful way Stephen King mixes horror movie with theology in Desperation. Not claiming to be an expert I do not recall any other horror movie of this type which has such a touch to reality and which discusses so frankly fundamental matters of faith in God. Just a few examples beyond the focus on the faith of that little boy, David and his prayers that are not left unanswered. The evil sheriff Collie Entragian (Ron Perlman) shouts in one point a great truthful question "Where was God when Jesus Christ was dying on cross with flies in his eyes?" This did not give the feeling of marketing trick after the success of Mel Gibson. At least I did not feel that Stephen King was trying to win American Christians to his side by including this rather awful moment to the movie. On the contrary, it gave me the impression of a genuine statement. As such it is very rare in Hollywood - to mention Jesus in this way. (Usually His holy name is used in modern English for cursing or expressing awe at something extraordinary). The Saigon episode 40 years earlier that changed Johnny's (Tom Derritt) decision to leave the city of Desperation is in my mind an element in Christian religion - finding, realizing and accepting the truth of one's actions and motives. Selfishness - for he did not try to save anyone in that bar in Vietnam - or sacrifice for the good of others. At the end this experience changed Johnny so much that he sacrificed his own life for the good of others. This is surprisingly deep thinking in a B-class horror movie! The biggest surprise waited me at the end of the movie. I actually said to myself "Is this possible?" For the big question of the horror movie Desperation gets an answer in the faith of the boy David who has seen a tragic accident of his young friend on a bike, the brutal murder of his dear little sister, the horrors in the town of Desperation, the cruel death of his mother and the disbelief of adults. Quite a load for a young boy. The movie ends with a reference to one of my great favourite verses in the Bible . We have come to know and have believed the love which God has for us. God is love, and the one who abides in love abides in God, and God abides in him. What is going on, Mr King? I was deeply impressed by the theological depth in this movie of yours.